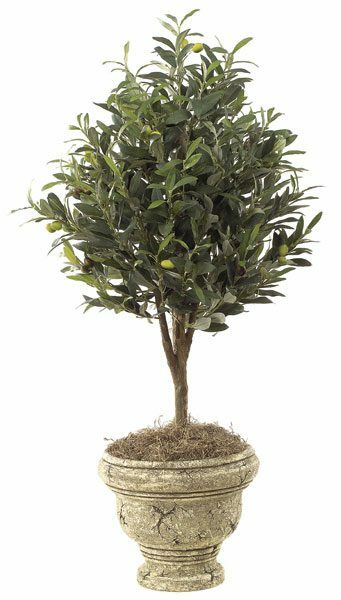 36 Inch Topiary Olive Tree - 32 Green/Brown Olives - Natural Truck. Our Topiary stands out in a Restaurant area or Home. Plastic base contianer included. Adding a decorative base container to match your decor would be a nice addition for an beautiful display. This striking 36-inch topiary olive tree is the perfect accent for your indoor or outdoor decor. Topiary trees give you an element of natural design without all of the work and high price tag and all of the hassles. This artificial topiary is intended to add a touch of style and natural dimension to your surroundings. The leaves consist of a range of Shades of Green from light green to a dark brownish green. The tree is elegantly designed with the trunk of the tree and the lower parts of the branches expose and elegantly trimmed leaves extend from Midway from the branches and reach upward. The leaves of the tree are wider at the bottom and are skillfully cut to a natural looking peak. This topiary olive tree comes with an elegant decorative container that resembles marble concrete. The tree includes olives attached to the stem.Does topiary tree would make a striking addition to and inside living room or perhaps in your patio area. D lovely Olive Tree Topiary give a warm Mediterranean feel without being too overstated. Make a design impact with a beautiful topiary that looks so real that no one will notice unless you tell them.